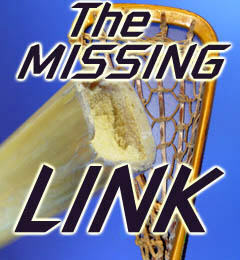 This section has several articles concerning the history, making and lore of lacrosse sticks. Since the gift of the Creator's game, Dey-Hon-Tshi-Gwa'-Ehs or Lacrosse, the Onondagas and the Haudenosaunee have long enjoyed playing this intense physical and intellectual game. But like most things, there are special abilities and talents that individuals possess that are needed even before the game can begin. One of those individuals is the Stick Maker. For over 50 years at the Onondaga Nation, that title has been held by Louis or Alfred Jacques. Coach Flynn has an Alf Jacques stick. 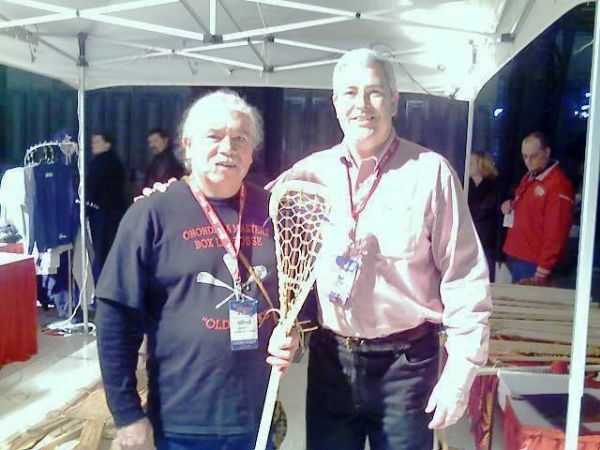 Alf Jacques [Onondaga Turtle Clan] is both lacrosse stick carver and lacrosse player. Alf learned the traditional art of lacrosse stick making from his father, the late master lacrosse carver, Lou Jacques, who taught Alf at age twelve to carve and web the lacrosse sticks. Alf himself is a professional box lacrosse player who is the only player to have held every position in field and box lacrosse. Alf carves his sticks from shagbark, shell or smooth hickory wood. The complicated procedure of cutting, seasoning, steaming, bending and carving from hickory wood is a time-consuming process and the netting involves a webbing technique with either leather or "gut." Alf explains that for Native Americans, lacrosse is both play and religious tradition because as a medicine game, it "keeps the people alert." 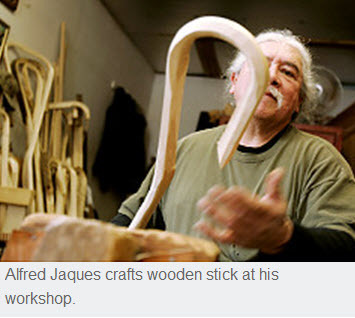 Traditional lacrosse stick maker Alf Jacques talks about the process of making wooden sticks. Wes Patterson, as depicted in this print, was a Tuscorora Native, which is part of the Iroquois Confederacy. He was a Native North American who knew as much about the cultural heritage of our National Summer Sport of lacrosse as any person in Canada. Wes Patterson was a very talented aboriginal who could make a complete lacrosse stick in approximately 20 minutes as you watched. He'd talk of the days as a young boy playing lacrosse and how you were not able to play on the team if you did not first select, cut your hickory limb, steam it, bend it, shape it, cut the leather strips and make the net. Coach Sullivan has a Wes Patterson stick. 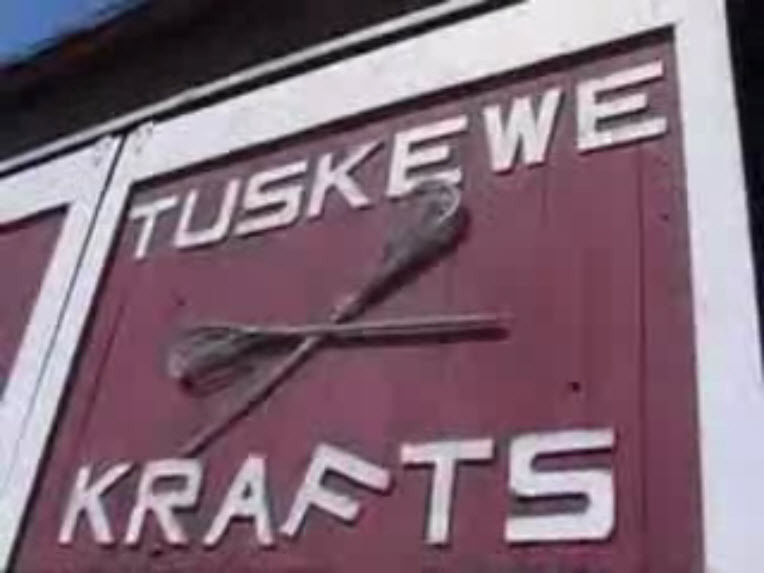 Wes has passed away, however sticks are still available from Tuskewe Krafts (716-297-1821), made now by Joe Solotes. 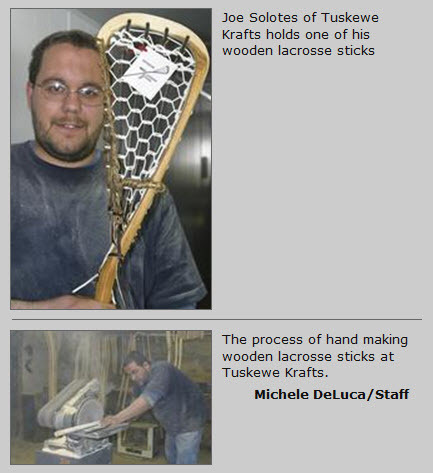 This tiny company in Western New York is the largest manufacturer of wooden lacrosse sticks in North America. Watch how stick maker Joe Solotes crafts a stick from shagbark hickory. Barry Powless once did the unthinkable. He left his lacrosse stick in the rain. Powless, a Native American, woke up the next morning to his father's reprimand: "Where is your lacrosse stick?" His eyes got wide. His heart sank. He had committed something akin to a sin among Native Americans. The shame of the deed weighed heavily on Powless' mind. Lacrosse, he learned, is a sacred activity among the Iroquois. It can act as a substitute for war, as a medicinal ceremony, as a unifier of the six Iroquois nations. Its equipment is so revered that he Iroquois are often buried with their lacrosse sticks, made of hickory and cowgut, hand-carved and cured for as long as a year. For Powless at the time, it was pretty heavy stuff. "It was then that I realized just what the stick meant," Powless said. "I came away with a better understanding of what the game meant to my people." "It was like him leaving his arm out there," said Wes Patterson, a Native American and master stick carver. "Your stick is a part of you. It is a sacred thing. Leaving it out in the rain ... it's like cutting your arm off and throwing it in the lake." Lacrosse has been an integral to the Iroquois culture for more than 1,000 years. Families were known for their prowess in the sport. Children were given a stick as soon as they could walk. It was, and still is, much more than a game. "My grandfather played. My uncles and my dad played. And I played in a lacrosse league as soon as I could walk," Powless said. Powless, 32, a member of Onondaga Nation who lives on the Onondaga territory just south of Syracuse, is still learning just how sacred lacrosse is to his people. In the past 30 years or so, lacrosse has become a popular high school sport, especially in the Central New York, Long Island and Baltimore areas. Athlete’s too small or too short for football or basketball can ride speed and agility all the way to an NCAA Division I lacrosse scholarship at places like Syracuse University and Johns Hopkins, a pair of perennial lacrosse powerhouses. Powless took advantage of the opportunities his sport could provide. He became a high school All-American attacker at LaFayette High School. He went on to play the game on scholarship at SU for three years, and then to Vancouver, British Columbia, where he played in the in the Canadian Box league for eight years. He was a member of the National Team that traveled to Perth, Australia to play in the 1990 World Championships. Now, he has returned home. He lives on the reservation. He coaches at his high school alma mater, trying to encourage his cousins and their classmates to follow his lead. "We need to learn the fine points of the game, the vocabulary," Powless said. Native Americans need, essentially, to catch up to the evolution of their own sport. After sharing the game with whites about 100 years ago, Native Americans found themselves shut out from field lacrosse. 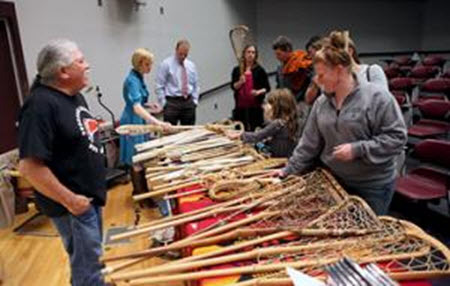 White players formed field lacrosse clubs and promptly excluded their teachers. When the World Field Lacrosse Championships began in 1968, the Iroquois were not invited; it was a closed clique comprised of the United States, England, Canada, and Australia. "They considered us professionals," Powless said. "We were just too good!" said Irving Powless Jr., Barry Powless' father. "We beat them all the time." Still it hurt. It still does. Neal Powless, Barry's 17-year old brother and player on LaFayette's team, puts it bluntly: "They robbed our game from us." Native Americans were relegated to playing indoor lacrosse. Developed in Canada, the "box" game is a harder hitting contest. Cross checks, unlike field lacrosse, are allowed. Poke checks, where a player pokes at the opposition’s stick, are not legal in box but are legal in field. However, Iroquois players tired of seeing their game spotlighted by relative newcomers. They wanted a piece of the field lacrosse action and, in 1983 the Iroquois National Team was formed. "We saw lacrosse getting so big - and we were good enough to not watch the world go past us," said Patterson, who was the president of the Iroquois National Team from its inception until two years ago. The team petitioned for membership into the World Federation and was denied. It wasn't until 1990 that it was allowed into the federation. It was only then that Patterson got out. "I was getting old. The game had tired me out," said the 66-year old Patterson. But Native Americans are not easily detached from the game. Irving Powless Jr. played lacrosse with his father, when the elder was in his 40s. Irving Powless Jr.'s grandfather played into his 60s he said. Powless Jr. gave up the game when he was 41. Barry is 32. His forearms are nearly hairless, rubbed smooth from friction with elbow pads. His elbows are callused from falls. Neal aspires for similar longevity: "I want to play the game for as long as I can." With his lacrosse stick-making business growing in size, Patterson has left it up to the youth - like Neal Powless - to regain lacrosse glory for the Iroquois. 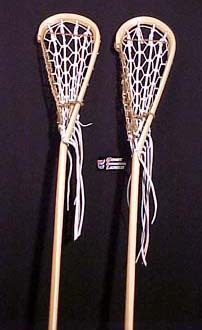 At the 1990 World Championships, the Iroquois did not win any games, but they won plenty of respect. They will be back when the games are played in 1994. By then perhaps the Iroquois can match the dominance of the Americans and the Canadians on the field. The decades-long exclusion from field lacrosse has hurt the Iroquois, who have concentrated on box lacrosse and have taught their children to do the same. "The games are very different," said Barry Powless. "It takes different skills for each." He should know. After excelling in field lacrosse in high school and college, he had to switch and played - by invitation - in the Canadian Box league. Now he plays for the Major Indoor Lacrosse League (MILL) for the Buffalo Bandits. There are 175 players in the league. Only six are Native American. 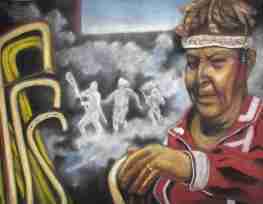 Remarkably, the elders among the Iroquois do not bear anything resembling a grudge toward those who took their game and raised its level of play. Irving Powless Jr., now 62, said he gets into his car and drives to wherever the best lacrosse is being played, be it Canada or Cortland State. Patterson, who owns the world's largest stick-carving factory (about 9,000 wooden sticks a year), profits from the games growth. Barry Powless says he wants to give back to the game as much as he can, having gained so much of it himself. That desire played a part in his return to the Onondaga reservation. He passed up coaching the Iroquois Junior Nationals to fulfill his commitment to the LaFayette squad, and the results are showing. LaFayette had its best season in years, going 11-8 and advancing to the second round of the playoffs before losing in overtime last year in Powless' first season as coach. This year, thanks to coaching style and background, the team is more than one-third Native American. And is favored to be a power among Section Three's Division III league, returning most of its players from a year ago. Now the elders see the game as something that is beautiful and growing. It is the youth who feel the fire. "Others players see it like any other sport," said Gewas Schindler, a sophomore at LaFayette. Schindler, an Oneida was born on the Catteragus reservation near Buffalo. Every summer, he stayed with his father's people, the Senecas on the Catteragus, and played box lacrosse there; the Onondagas had no youth program of their own. It is through his skills he hopes to reclaim glory for his people, by excelling as much as possible. "I'm going to make myself better," Gewas said, his soft features hardening a bit "It's my game. I'm going to try to get it back." Neal Powless feels much the same way. "I'm grateful to the older people for what they have taught me," he said, "but we, as a people, started the game. Then we were banned from it. 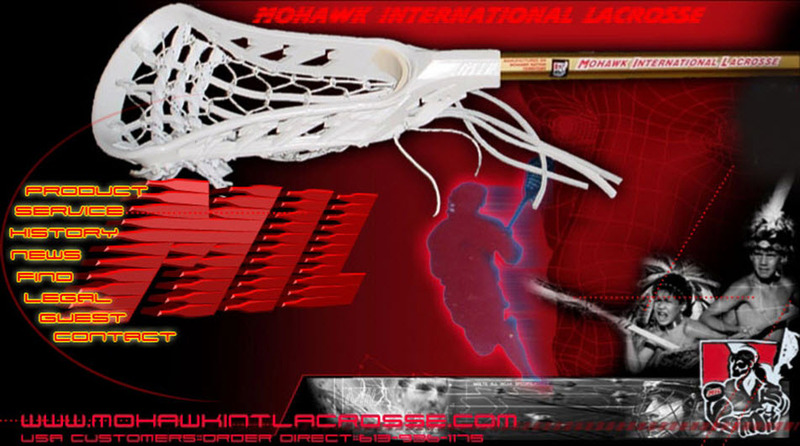 We went around teaching people how to play ..."
Neal Powless is grateful for that. He like many Iroquois youth whose families have the game in their blood, has played the game since he can remember. So did his father before him, and his grandfather, and his great-grandfather. It is much more than a game for Neal Powless. And the stick his father gave him is more than just a stick: "It's part of me. It has always been and always will be part of me." "Do I want to be buried with my stick?" Neal responded, "Yes." click on the picture to read about the evolution of stick design.